Ever wonder what the Sun might look like from the skies of another world? This is an imaginary view from Upsilon Andromedae (…kind of — strictly speaking Upsilon Andromedae is probably a few degrees up and to the right from where this view is being seen). 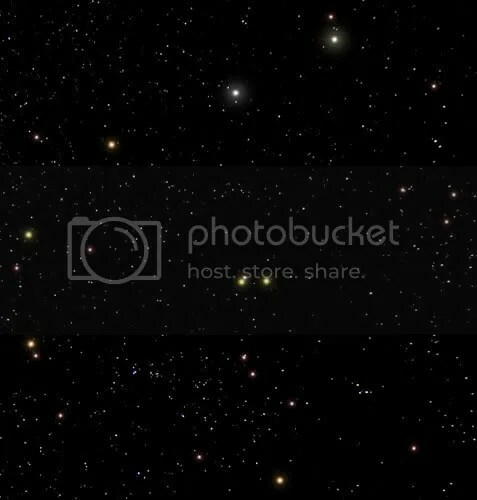 The bright stars near the top are Procyon and Sirius, the yellow stars near the centre are Alpha Centauri and The Sun (Alpha Centauri has Proxima sitting virtually on top of it). Dotted about are various red dwarfs like Wolf 359, UV Ceti and Barnard. The orange star in the upper left is Epsilon Eridani. All distances are more or less as they would appear in the sky. This entry was posted in Imported from Livejournal and tagged planets, stars. Bookmark the permalink.